Analysis: Ateman has been nudged down the depth chart throughout the offseason due to the trade for Antonio Brown and signings of Tyrell Williams, J.J. Nelson and Ryan Grant (toe). Still, Ateman may get in the act as an X receiver in 2019, considering GM Mike Mayock called him the projected starter at the spot before all the additions. In a seven-game cameo to conclude last season, Ateman hauled in 15 of his 31 targets for 154 yards and one touchdown. Analysis: It's a net loss for Ateman's standing on the depth chart, seemingly dropping him to No. 4 behind Brown, Williams and slot man Seth Roberts. 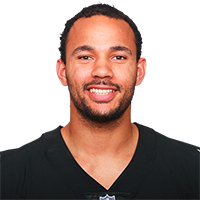 The Raiders do at least seem to view Ateman as an asset, with general manager Mike Mayock saying in late February that the 2018 seventh-round pick would enter the offseason as a projected starter. He obviously lost that standing in a hurry, but Ateman should still have a good chance to keep his spot on the 53-man roster. Analysis: The seventh-round pick made a bit of noise toward the end of his rookie season, but marks of 10.3 yards per catch and 5.0 per target don't exactly make the best case to keep him in a starting role. At the very least, Ateman will face significant competition for the job, and he may even need to battle for a roster spot if the Raiders have a busy offseason at his position. 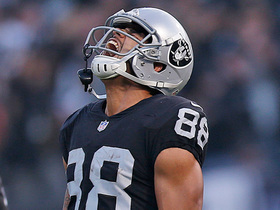 Analysis: Ateman, who was a seventh-round selection by the Raiders in 2018, spent the first 10 weeks of the season on the team's practice squad before earning the callup. He finished his rookie campaign with 15 catches on 31 targets for 154 yards and a score in seven games. Ateman may have proved himself worthy of a spot on the active roster from the get-go in 2019 as he provided a big-bodied presence on the outside following season-ending injuries to Martavis Bryant (knee) and Brandon LaFell (Achilles). Analysis: Ateman was on the field for 83 percent of the Raiders' offensive snaps Sunday, but he failed to translate his involvement into significant production with just a 40 percent catch rate. Nonetheless, the rookie has caught at least two passes in all five contests since being promoted from the practice squad Week 11. Up next is a Broncos defense that held the Browns to under 200 yards passing Saturday. Ateman brought in three of four targets for 45 yards in Sunday's 24-21 win over the Steelers. Analysis: Ateman recorded his second catch of 20-plus yards in four games as the rookie continues to become integrated into the Raiders offense. 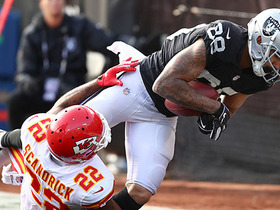 He's still positioned behind the trio of Jordy Nelson, Jared Cook and Seth Roberts in the pecking order of Derek Carr's targets, but Ateman was on the field for 75 percent of the team's offensive snaps Sunday. Ateman's 6-foot-4, 220-pound frame could entice Carr to look his way in the red zone against the Bengals on Sunday. Ateman caught two of four targets, accounting for 16 receiving yards and one touchdown during Sunday's 40-33 loss to Kansas City. Ateman caught three of 10 targets for 16 yards during Sunday's 34-17 loss to Baltimore. 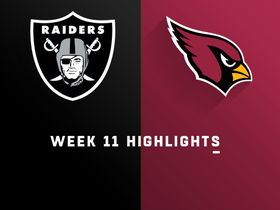 Analysis: The rookie, in just his second game, had five more targets than any other Raider on Sunday. He's been targeted a whopping 15 times in two games. He hasn't done a ton with them, absent last week's 32-yard reception, averaging just 5.7 yards per catch. Next Sunday's game against Kansas City could help toward his development as the Chiefs, often playing from ahead, have surrendered a league-high 320 passing yards per game. Ateman caught four of five targets, racking up 50 yards against Arizona in a 23-21 win Sunday. Ateman could take on a significant role in the Oakland offense while Jordy Nelson and Martavis Bryant recover from knee injuries, Scott Bair of NBC Sports Bay Area reports. 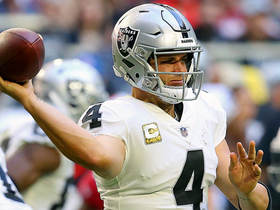 Oakland Raiders quarterback Derek Carr finds wide receiver Marcell Ateman for a 28-yard gain. Oakland Raiders quarterback Derek Carr launches it to wide receiver Marcell Ateman for 32 yards.